Guéthary: a Basque village near the campsite. The attractive little village of Guéthary (known as Getaria in Basque) covers an area of more than 140 hectares. 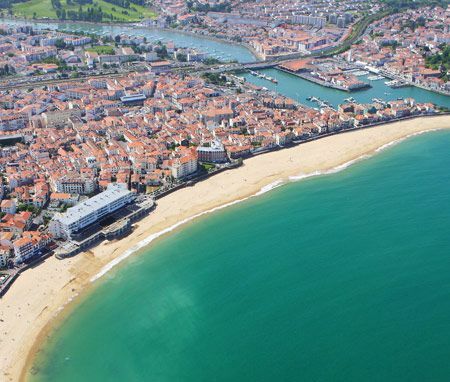 It’s in particularly good company, being surrounded by the towns of Saint Jean de Luz, Biarritz and Bidart. What's more, it's just five minutes from your camping pitch or your mobile home! This district’s streets and buildings still display many traces from its history. Take the time to stroll here, noting the changes in architecture from the church built in the 16th century through to Guéthary’s 19th-century railway station. Don't forget to go for a walk in the village’s fishing port. It today houses pleasure boats, while numerous restaurants and bars grace the seafront with their terraces. Guéthary is a great place to stop off for a drink or a meal looking out to sea.